Charles Cornwallis appointed Governor-General of India. The State of Junagarh, whose accession to India was protested by Pakistan in the UN Security Council, voted in favour of India in a popular referendum held on 20 February. Government of Madras province was renamed as Tamil Nadu. Prithvi, India’s first indigenous designed surface-to-surface tactical missile of 250km, was successfully test fired from Sriharikota. India becomes the fifth country to develop such a missile. Fatwa against writer Salman Rushdie by Supreme religious leader of Iran, Ayatollah Khomeini. Cuban President Fidel Castro left his post of President after 50 years. 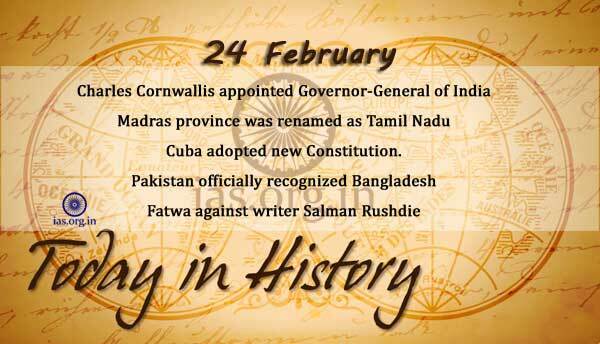 Madras state was renamed as tamilnadu in 1969 january 14 th.